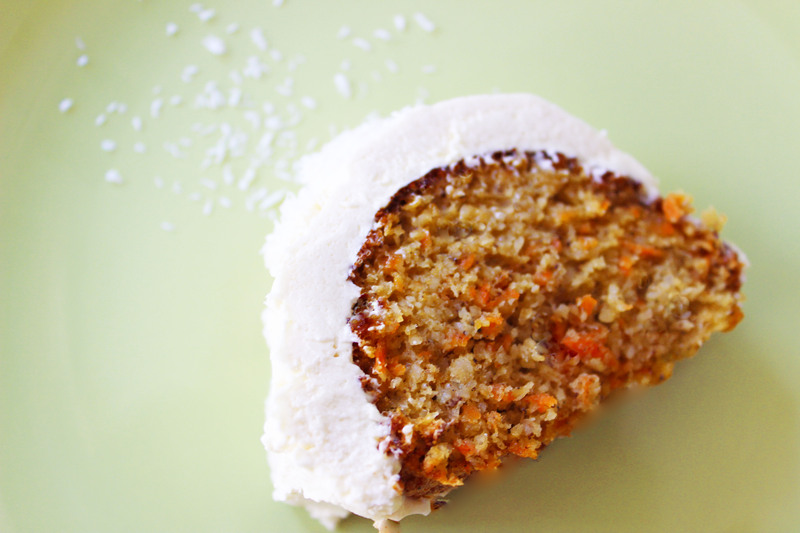 Coconut carrot cake… topped with white chocolate buttercream. I am thinking this is worthy of a celebration all by itself! When Essential Living Foods reached out to ask if I wanted some to cook with, I was very excited. I have been in love with their raw olives, mango slices, superfood berries and raw cacao butter (*I use it to make my favorite homemade almond butter white chocolate!) and much more for years. So, I thought it would be fun to mix some superfood into some traditional cake! Well, traditional but also gluten-free, Paleo and most vitaly, Specific Carbohydrate Diet friendly! 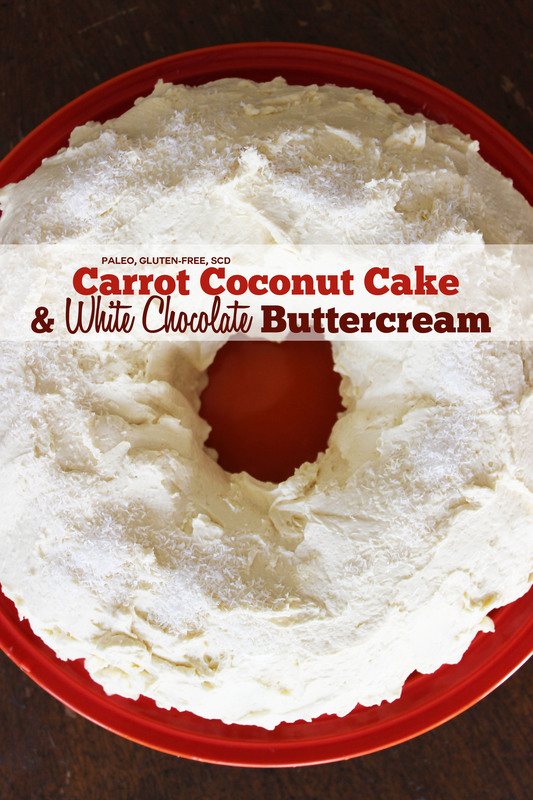 This melt-in-your-mouth cake is a blend of two favorites from Specific Carbohydrate Diet forums. Together, they become something magical. They are time-tested and I am betting everyone you know (not just the gluten free folks) will love this! 1. In a large bowl, blend the carrot, coconut, honey, and vanilla. 2. In a separate bowl, beat the egg yolks to a creamy consistency. 3. Fold the egg yolks into the carrot-coconut mixture and let it stand in the refrigerator for 1 hour, or until it has soaked up the moisture. 4. Add the ground cashews and blend. 5. In another bowl, beat the egg whites until stiff. 6. Fold the egg whites into the carrot-coconut mixture. 7. Make two 9-inch layers or pour the mixture into a bundt pan. 8. Bake in a preheated 400 degree F (220 C) oven for 10 minutes, then reduce the temperature to 350 degrees F (180 C) and bake for an additional 20 to 30 minutes or until the cake shows signs of leaving the sides of the pan. Whip the egg whites and honey with a hand beater or in KitchenAide until doubled in volume. Add the vanilla. Finally, add the butters and whip. I had to refrigerate mine mid-way because my kitchen was too hot and it wasn’t firming up after over 10 minutes of whipping the first time. If this happens to you, refrigerate for 10 minutes or until semi-solid & whip again semi-solid once out of the fridge until you get frosting! Once the cake is cool, flip it onto a serving dish, ice it up and throw copious amounts of coconut all over it. Store it in the refigerator and it has a quality of old-fashioned cake we could only have occasionally in my house when I was little. My grandma wasn’t a fan of letting us have dessert… so I’m making up for lost time! 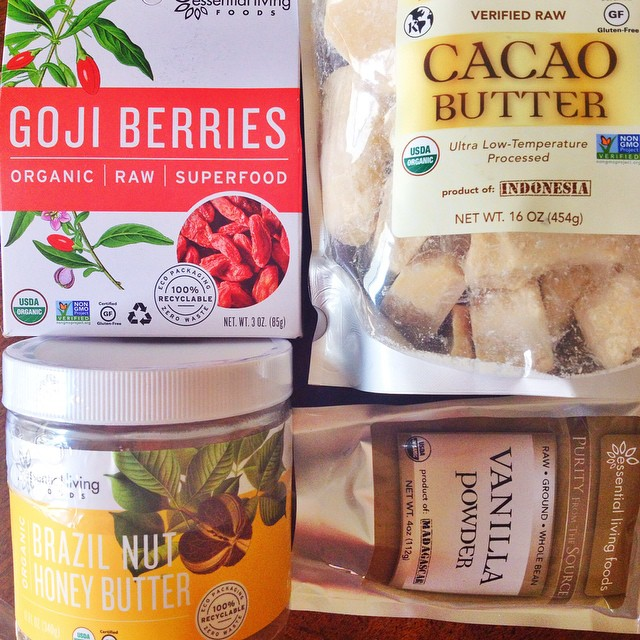 Thank you again Essential Living Foods for the perfect cacao butter, raw vanilla and other treats to try. Its always a pleasure! The Wellness Benefits Of Adding More Celery To Your Life Are Amazing! I tried this frosting recipe and it curdled and split after whipping for a few minutes, any suggestions as to why this happened ? Previous post: Creative Home Color Love In Splashes Of Green! Next post: Do You Feel Guilty For Taking Care Of Yourself?